At long last, the dirtiest waterway in Florida is about to get a good scrubbing. Fourteen years after concentrations of dioxins, a deadly family of cancer-causing chemicals, were discovered in sediment at the bottom of Miami’s Wagner Creek, the city is getting around to cleaning it up. The waterway snakes for 1.6 miles from Allapattah through Jackson Memorial and past the historic neighborhoods of Overtown and Spring Garden before emptying into the Miami River. The city has signed a contractor, Sevenson Environmental Services, a national leader in environmental dredging and remediation and expects to issue a issue a notice to proceed on the $18 million project this week, said Jeovanny Rodriguez, chief of the city’s office of capital improvements. After 90 days of planning and design work, Niagara Falls, N.Y.-based Sevenson should begin dredging the creek. The Seybold Canal, a channelized length of the waterway that connects to the river, will be part of the project. The dredging is designed to safely remove several feet of sediment at the bottom of the waterway that’s laced with dioxins, arsenic and other pollutants, said Horacio Stuart Aguirre, chairman of the Miami River Commission. The state-chartered watchdog agency has been pushing the city to clean up Wagner Creek for years, but there has been little urgency to do so because the toxins are contained within the sediment and are not believed to be leaking out. Still, there is a risk that a storm could break it loose and push contaminants into the Miami River, he said.“It has some really horrible stuff in it, and some of that stuff is highly toxic,” Aguirre said. “We want to scoop it out while it’s still contained. If that sediment breaks loose and washes out, then a huge amount of toxic sediment will spread along the river. We don’t want that to happen.” The dredging work, expected to take 15 months, carries other benefits, including increasing the waterway’s flood-protection capacity and improving its navigability. Sedimentation and shoaling from stormwater discharge into the creek has drastically reduced its depth over the years. 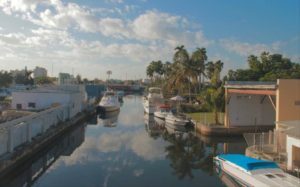 At places, the waterway is so shallow at low tide that marine businesses on the Seybold Canal must wait for high tide before it can accommodate larger boats, according to the river commission. One commercial fishing operator reported two boat propellers were damaged after hitting the bottom of the canal. Meanwhile, recreational boats docked behind homes along the canal rest directly on the bottom at low tide, the commission says. As the mud from the bottom of the creek is removed, it will be collected in deposits along the waterway and tested, Rodriguez said. The level of toxicity will determine precisely how the dredge material is disposed, he said. The dredging project will result in a cleaner waterway, better flood protection and even higher property values for homeowners along the waterway, Aquirre said.